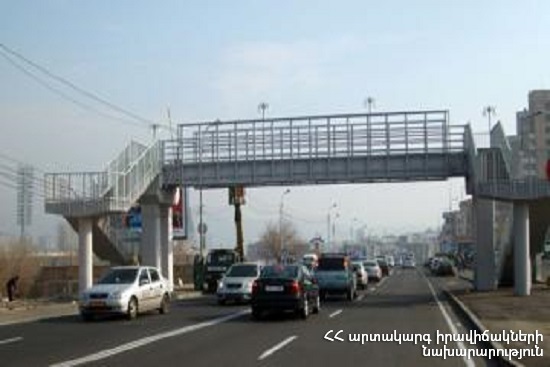 On April 11, at 14:12 an emergency call was received to “911” service that a citizen was threatening to commit suicide by jumping off an overhead pedestrian crossing near French University in Armenia in Davit Anhaght street, Yerevan. Before the rescuers arrived at the scene the citizen A. G. born in 1999 had been brought down from the overhead pedestrian crossing by local forces. The citizen went to the municipality of Arabkir administration district where the citizen's condition got worse. The rescuers moved A. G. to ambulance car. The casualty was hospitalized to “Armenia” Republican Medical Center where receiving necessary medical aid was discharged.